I get together every other Monday with my "MITI Mom" friends. The "MITI" part stands for Moms In Touch International. We meet to pray for our kids. And I mean pray. My natural tendency would be to talk a lot more than I pray. And apparently I'm not the only one like that, so MITI suggests planning a fairly structured prayer time, including Praise, Confession (which is silent), Thanksgiving and Intercession. Of course, we can always bring our own requests in our own words, but we are learning to pray God's words for our kids. Elizabeth Elliott says it so much better. This is from "A Lamp For My Feet." Often I pray for someone whose circumstances or needs are unknown to me. There are many prayers in Paul's letters which may be used for almost anyone. One of my favorites is in Colossians 1:9-12. A part of this prayer asks "May He strengthen you, in His glorious might, with ample power to meet whatever comes with fortitude, patience and joy, and to give thanks to the Father" (NEB). That seems to cover every possibility. It does not ask for instant solutions or reversals. It does not call on God for miraculous deliverance out of any trouble that might come. It asks for a truly Christian response, by the sufficient power of God: to meet whatever comes as a true Christian should meet it, with the Holy Spirit's gifts of fortitude, patience, and joy. It asks for the power to give thanks. It takes power, doesn't it, to thank the Father when everything in us protests? But we find in Him (not always in what happens to us) plenty of reason to thank Him and plenty of power. The wedding day was fast approaching. Everything was ready, and nothing could dampen Jennifer's excitement. Her mother Sheila finally found the perfect dress to wear and would be the best-dressed mother of the bride ever! A week later, Jennifer was horrified to learn her new mother-in-law, Barbie, had purchased the same dress. She asked Barbie to exchange the dress, but Barbie refused, "Absolutely not! I'm going to wear this dress. I'll look like a million bucks in it!" Jennifer told her mother, who graciously replied, "Never mind, dear. I'll get another dress. After all it's YOUR special day, not ours." Sheila grinned and replied, "Of course, I do, dear. I'm wearing it to the rehearsal dinner." At his birthday last summer he received some great bird books. His favorites are a book of birds of the PNW, from Grandpa Burke and Granny Mary, and a book that not only shows pictures but also plays recorded bird calls, I think from Uncle Dave. He confidently names all kinds of birds. Maybe over-confidently? But then he'll show me a picture and I'll have to admit that he's right. 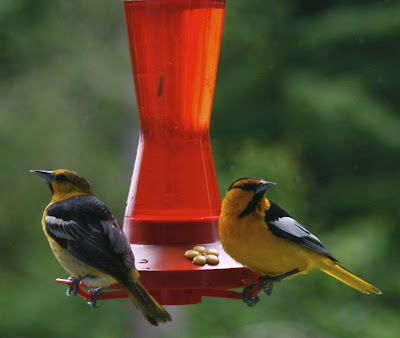 He had his eye on this pair, visiting Aunt Tami's hummingbird feeder, but we didn't recognize them and they were pretty skittish. She was able to get a picture through the window and emailed it to me. Wyatt identified them in about 30 seconds. We've been learning about idioms recently. Apparently figurative language can be tricky for deaf/HoH folks, although Tate seems to be really enjoying this. Probably because he sees himself as the comedian of the family, though anyone with a 10 year old boy will understand our misery. A surprisingly, (or not), high percentage of boy-humor revolves around bodily functions and odors, which - even in this household - have a limited appeal. Actually, sometimes he's funnier than he knows. He really likes to use big words, and his vocabulary is impressive. But sometimes he's just almost there, but not quite. Like when we announced that we were going to go Out To Dinner. The boys immediately started lobbying for their favorite places, but Kerry wanted Chinese food... not their favorite. Tate said, "Well, that would be all right, but we're not quite immune to it." Um, Tate, it's not poison. But that's not what he meant. Really. I don't know what word he was reaching for, just that he wasn't thrilled with the idea of Chinese food. "For to me, a cheese-burger is good, but pizza is better... yet what shall I choose? I do not know! I am torn between the two: I desire to have pizza and chocolate, which is better by far, but it is more necessary for me to eat fruits and vegetables..."
I know, I know. Some of you are operating under the delusion that I have my act together. Let me quickly dispel that notion. I made a discovery today, are you ready? Today is TUESDAY. Yes, that's right, it's TUESDAY. The day following Monday, which was a holiday. So, though it may feel like Monday, trust me, it is indeed TUESDAY. And, if it makes you feel better, know that I came to that brilliant conclusion exactly 10 minutes before we were expected to meet with the D/HoH teacher, while I was calmly meandering downstairs, considering our plans for lunch. Which ended up involving a drive-through with a Big Yellow M above it, squeezed in between 1pm sign language and 2pm piano lesson, children eating in my van (normally forbidden), and me throwing out encouraging and edifying comments like, "If you'd just chew faster you could finish that second hamburger before we get to the top of the hill," and "Of course hamburgers are nutritious, they've got all the food groups in one tidy package," and "We'll just count ketchup as the vegetable," and "Don't be such a sissy about seat belts, we need Wyatt's music bag from the back of the van," and "No, I'm not speeding, it just feels like we're going faster because... because you're chewing." Possibly I'm out of the running for "Mother of the Year." But the good news is that I did remember to mention to Wyatt's piano teacher that the day she's chosen for the end-of-year recital just happens to be Gunnar's and my dad's birthdays. So whatever piece she'd like Wyatt to learn for the recital, we'd also like to add the birthday song, which he's already learned. She's all over it. But Wyatt, being troublesome, then announced that the way he learned it (weeks ago) is much too babyish for an advanced pianist, such as himself. Because, you know, he's been taking lessons for all of four months. She gently explained to him that the more advanced version would require playing chords with his left hand while picking up his right hand and moving it about the keyboard, which may possibly be difficult to manage at this stage of the game. He's contemplating that. But not happy. I told him that I would photocopy the "baby" version from his book, and see if I could dress it up a bit, keeping it within his reach. Outside My Window... My "dogwood cloud" is still going strong, and tossing in the breeze today, which is chilly. The boys are out in the yard with Jonathan, a friend and neighbor. 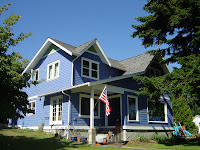 Laundry flaps on the line, and the flag on the pole in front of the porch. I am thinking... how strange it seems to be writing this when it's not a school day! Today doesn't feel like a Monday. Also, being Memorial Day, I am thinking of the book we've been reading, " A Fighter Pilot In Buchenwald". I am creating... plans for summer "projects", because that doesn't sound at all like "school." I am going... round in circles? I'm anxious to be planning out our next school year, but need to buckle down and finish this one. I'm worse than the boys. I am hearing... Wyatt, practicing piano, with intermittent bouts of whining and complaining. Apparently I have not only ruined his day, but his entire life, with my unreasonable expectation that he tear himself away from Dino-opolis for 30 minutes. Adolescence has descended upon us. Around the house... I mentioned last week that we had a contractor here working. (You do want to think carefully when you hire a contractor, because you're going to be spending a lot of time together. Good thing we chose well, as Rod has become a family memeber...) We did our Big Remodel in 2005 and 2006, and it is still going on. That, BTW, is no bad reflection on our contractor, but the state of our finances. One of my favorite things... tight vocal harmonies, like Gene Puerling's "A Nightingale Sang in Berkely Square." A Few Plans For The Rest Of The Week: nose to the grindstone. Finish math with Wyatt and Tate. Schedule testing. Clean. Sort. Wash. Repeat. My friend Leah tagged me for this one. And she set the bar pretty high! She writes wonderfully about her two little guys, Nolan and Matthew, at "Say What". Good gracious. They’re growing like dandelions! But more than their size, I love watching my boys mature and develop. Sometimes faster and sometimes slower, sometimes with ease and sometimes with great frustration, we are making progress. They learn, they grow, they develop skills… from riding bikes, reading, swimming, building, long division, apostrophes, geometry, and spelling, to memorization, courtesy, self-control, and wisdom. We haven’t “conquered” all these things, but we’re making progress. Not much is “ho hum” with kids. We won’t dwell on the downside of that equation, but the upside is the exuberance with which the boys devour life. They are the very definition of “whole-hearted”. They play soccer with every fiber of their being. They work on their “treehouse” (Kerry calls it a Bubba Shack) like their lives depended on it. You should’ve seen them last winter when the sanding truck came around and ruined their sledding hill. They were out there in minutes, with shovels and sleds, organizing anyone who would help into a brigade to haul snow from the neighbors' yards and spread it on the road, covering up the nasty sand. Hah! They may be getting bigger, but I still get plenty of lovin’! I'm reluctant to tag anyone because it seems like a busy time of year. But if you want to play, leave me a message - I'd love to see what you have to say. Have you seen this - Death is not Dying? My friend Susan, in Brazil, sent me this link. I don't have the techie cleverness to import the video, but you can click the link above and see it for yourselves. But wait until the kids are in bed, because it's almost an hour long and you won't want to be interrupted. And you'll want tissues. Rachel is a young mother and wife, and she is dying of breast cancer that has spread to her bones, liver, and brain. She was asked to speak to the women's group at her church in Vancouver, B.C. They expected about 40, but apparently ended up changing the venue to accommodate ~600 women. She clearly and compellingly gives a reason for the hope that she has. You'll want to listen. Well, what makes this funnier is that just yesterday my friend Cutzi told a story about her 3-year-old losing his underwear, and I thought, "Ha ha! Aren't 3-year-olds funny?!" Me - "Gunnar, get up and go potty." Gunnar - "Okay mommy." But no progress toward the bathroom. Me - "Gunnar, you need to get up and go to the bathroom. Gunnar - "Okay mommy." He pushes the covers back. Me - "Gunnar, you need to get out of bed and go to the bathroom." Gunnar - "Okay mommy." He stands on the floor. Me - Waiting for progress... "Gunnar, go to the bathroom." Gunnar - No response, but I hear him removing his pajamas. He is standing in front of Kerry's dresser. Me - "Gunnar! Go into the bathroom and go potty in the toilet!" Gunnar - Gives me a bewildered look, but shuffles into the bathroom with an, "Okay Mommy." Me - Hearing little tinkling sounds in the toilet, I realize that I am now fully awake and get up to use the bathroom myself. Gunnar - exits the bathroom with nothing on but his pajama top. Me - "Gunnar, put your jammies back on." Me -wake up before 6:30, but stay in bed, not wanting to wake anyone else. "Mommy, where are my underwear?" Can you believe "only" 57 people were killed? Not to make light of their lives, but - really - look at how much of the mountain is missing, and then check out this (short) video. Really, click HERE and I'll wait. The series of photos at the beginning just take my breath away. Although the mountain looks black, most of what you see in the photos is snow and glaciers, covered with dirty ash. When the earthquake collapsed the north side of the mountain, an unbelievable amount of snow was instantly melted, causing a huge, hot mudflow. Part of the reason the volcano erupted so explosively was much of that ice and snow flashing instantly into steam. If you ever have the chance to visit the area, DO IT. There are three visitors centers - one to the west near I-5, and two up the highway near the mountain. (Although I've heard that the most impressive, the Johnston Ridge Observatory, has been closed. You can still drive up there, but can't get in the building. Too bad!) Just outside the park, Weyerhaeuser's Forest Learning Center had a ton of hands-on stuff for the kids, and several herds of elk tend to 'hang around' in plain view, below in the valley. Of course, all the government-run centers have a heavy-handed, preachy, environmental message. However, some friends had told us about the 7 Wonders Museum - a creation-science counter-point to the "party line". But I digress... if you're going to Mt. 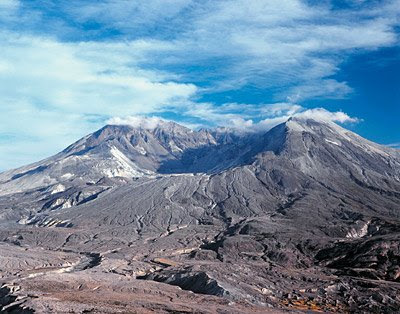 St. Helens, don't miss the 7 Wonders Museum. Let them know you're coming and they'll host you in fine style. Lloyd gave our family a personal presentation. We had prepared the boys (and ourselves) before our visit by researching the events leading up to the eruption and the effects afterward, which was very helpful. Lloyd talked kind of fast, being very passionate about the subject, and gave quite a bit of technical information. The boys were 6, 8, and 11 at the time, and I wondered if they were "getting it". Shouldn't have worried. As we left, Tate said to me, "Mom, I found that quite interesting because it was a Christian way of telling it, so I didn't have to ignore any of it... like how old stuff is." It wasn't until I looked at the date I had written in the post below that I remembered. Today is the anniversary of the eruption of Mt. 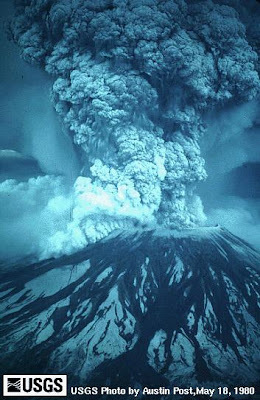 St. Helens, 29 years ago. It is still active today, and if the weather is clear, you can see it "live", via the Mt. 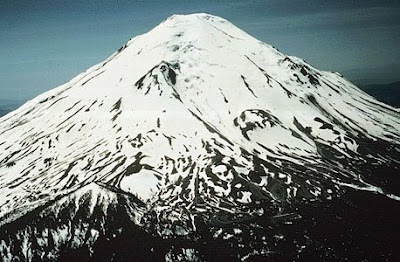 St. Helens VolcanoCam. I just checked and saw nothing but gray... must be in the clouds. I remember our house shaking from the concussion of the blast, although - fortunately - no ash came this way. What you can't see, in the famous photo, is that a huge portion of the mountain on the left (north) side has been completely blown away. I'd love to sit and ponder now, but the natives are awaiting lunch and getting very, very restless. I am thankful for... a bike for Tate! He is way too big for his bike, and Gunnar really should be using it. But I couldn't justify spending very much on a luxury like that right now. When - "wa-WAH", Kerry's brother called and offered not one, but two bikes his boys have grown out of. Thank you, thank you, thank you. From the kitchen... the elk roast I was going to put in the crock-pot this morning is still in the fridge. Oops. Oh well, that'll be tomorrow's dinner. For tonight? Taco salad - that's quick. I am creating... more plans than I can juggle in my brain. Ack. Finishing, sorting, cleaning, selling, end-of-homeschool-year-partying, etc. I am going... crazy? Maybe, but before that... Tate and I are going to visit a nearby deaf school on Friday. He has been the least interested of the three boys to learn sign language. It's like pulling teeth. Ridiculous. We're hoping that being around other kids, many of whom, do not speak or read lips, will encourage him to actually try to use what he has learned. I am reading... "The Joe Moser Story - A Fighter Pilot In Buchenwald", with the boys. Kerry and the boys went to a big Father/Son event and heard Mr. Moser speak, about a month or so ago. I'm not sure how much he covered in that group, but the boys were fascinated and Kerry bought his book. I'm so glad he did! 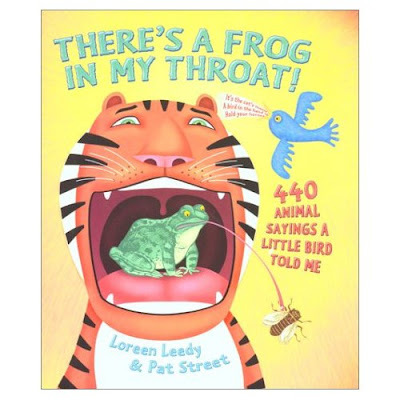 I don't know if you can find the book in bookstores yet, so I made a link on the title. At least, I thought that was the title, but really it may just be, "A Fighter Pilot in Buchenwald", by Joseph F. Moser, as told by Gerald R. Baron. We'll probably read it again when we study WW2. I am hoping... to finish well, as we come down the homestretch of our second year of homeschooling. I am hearing... the boys, consulting each other on details, as they try to set up an account on "Lego Universe", rain dripping on the roof and down the gutters, but no birds... the rain has quieted them down. Around the house... wood and MDF trim. We remodeled the upstairs of our house in 2005-2006, but didn't do all (or much) finish work. The four bedrooms and hallway all had painted plywood floors (because we're high-class that way, though we did lay industrial strength vinyl in the bathrooms), there were no closet doors, and no floor-, door-, or window-trim. Summer of 2007 we put down laminate floor, which I love. It's much easier to keep clean than painted plywood, (so I am without excuse *sigh*), and it looks a million times better. Now, 2009, we're finally getting around to some of the trim. Well, honestly, it may seem kind of odd that we're doing it now, when we're rather... ummmm... broke-ish, but circumstances compelled us. The vinyl floors, which were glued down, were beginning to curl up around the edges. They really needed the trim to hold them nice and flat and smooth, or we'd have to re-do it. There are still no closet doors, and - honestly - I like it that way. Well, I wouldn't mind having closet doors in the hallway, ("Hello! And welcome to my accumulated belongings! "), but in the bedrooms... I'm tempted just to buy some pressure rods and cheap shower curtains. They don't take up space like closet doors do. But I'm not sure if my architect-husband will go along with that. One of my favorite things... a contractor who not only doesn't mind the boys being around and pestering him with questions, but seems to actually enjoy them. Not to mention, he fishes, and brings us delicious treats from time to time, like fresh tuna, and smoked salmon. A Few Plans For The Rest Of The Week: AWANA is done, freeing up Wednesday night :0), Wyatt still has a few more weeks of piano lessons, Tate and I will be visiting the deaf school, and... ??? Oh! I'm glad I checked the calendar, because Wyatt has a check-up tomorrow morning! Grandpa (a retired electrician) and the boys on a PTO day, playing with their Snap Circuits kit. Big fun! We had a busy day today, starting with a run to the grocery store at 8am. Which isn't so bad... it's pretty quiet there, early on Saturday mornings. I don't have pictures yet because I'm just flat out too tired to load them. Wyatt and Tate competed in the Junior Ski to Sea Race today. This is the kid-version of the Big Daddy next weekend. And I'm tired. Very tired. At random intervals I'll get an (impersonal) email from a relative of Kerry's. She's joined some new social networking site and wants me (and anyone else whose email she has ever collected) to be her "friend" on myspace or facebook or twitter. 1. It has been cold again. I went to bed Monday night and woke up shivering. Of course, for a deep sleeper like me, "woke up" is a slippery description. My sleep-fogged brain knew that my body was cold, and the best solution it came up with was not a blanket. No, that would be sensible. I found a little hand-warmer, the kind you unseal and put into your gloves on a cold winter day, and took it to bed with me. I think I held it against my chest, hoping it would warm my blood which would then circulate heat through my body. I don't know. Everything was fuzzy. I really don't think clearly at night. Woke up to SNOW in the hills around the lake. Yes, snow, below 2000'. In May, thank you very much. 2. We're up late (all of us) because we wanted to see the Space Station go by, since we actually had a clear night sky. You can see it too. Oh, the organizing part of my brain is happy tonight! And, why, you might ask? Because it's May, and that's when my favorite calendar comes out. Yes, in May. (Kerry thought I was nuts, too.) May, because it's based on the school year, which makes a whole lot more sense for how we live. Isn't it pretty? All shiny and new? And blue! And all those wonderful blank pages, awaiting my plans. Our anniversary and Mother's Day always come close together. Kerry brought home flowers - yea Kerry! - and has taken the boys out for a short bike-ride. We're going out to dinner - a romantic evening with the boys - and then to Coldstone Creamery. I already know what I want. was worried that I would have difficulty reading his message (because "love" didn't quite fit where he wanted it). I assured him that moms are expert at reading kid-script. poured his whole heart into this tribute! 2. One can use the lid of the paint tray to mix custom colors. We've been reading about the Lost Colony of Roanoke Island this week. We talked about the explorers making their own maps because none yet existed. I let them create and map their own imaginary islands. 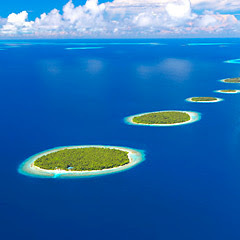 presented me with "G Island", (note the shape). than he has sometimes bothered with. Probably because if it's messy, boys like it, we've been doing some painting lately. I am not the artistic type, so this is a challenge for me. But with my printer broken (ouch!) our study of Astronomy turned into Art. I decided we would draw the constellations with crayon and then paint over them with water colors. That's when I discovered that blue is not just my favorite color... all of our boxes of watercolor paints were out of blue. So we made our own paint. And, just a side note, if you google "paint recipes" you'll sense my frustration. Do you realize how many paint recipes call for tempera paint? Well, gee, if I had paint would I need a recipe to make paint? Sheesh. This made for an interesting, rather gloppy paint that tends to flake off as it dries if you put it on too thick, but it was a fun project. Gunnar just finished his "Hiker" book at AWANA. That means he has memorized 35 verses in his first book, 56 in his second book, as well as completing other tasks, memorizing the books of the Old and New Testament, and a few "extra-credit" verses at the end of each book. he did them both twice. I found this on Gunnar's camera. The boys figured out how to photo-stitch on their cameras, not after the pics are downloaded. So, in Gunnar's words, "WA-WAH!" And, eventually, when I post pictures of my "new" curtains, you'll know what the living room looked like before. Outside My Window... Clouds, wind, rain, and my dogwood trees just starting to bloom. Not the least of which is that this Mother's Day was a bit calmer than last year's. From the learning rooms... the boys are having "recess", which means they're outside practicing for a three-legged race. That is, Wyatt and Tate will be in the race. Gunnar is running along behind them "encouraging". From the kitchen... nothing yet. I'm thinking leftovers for lunch (rice and bean burritos), and Chicken and Rice for dinner. I am wearing... *sigh* jeans and a sweater. I am creating... plans, plans, plans! We're winding down our "official" school year and I'm excited to plan for next year and to strategize about this summer. I am going... to gather the boys and start our history reading, to remember to pray for two friends in the process of adopting, to thaw out another turkey, and to encourage the boys to finish well (the school year). And now, Sir Walter Raleigh and the Lost Colony of Roanoke Island. I am reading... poking along through "What He Must Be". It takes a lot longer to read a book with Kerry. Okay, *pause*, I'm not saying that he's slow, just that it's harder to find time to read together. I am hoping... to have great inspiration for summer activities. That don't cost anything. And to finish our memorization goals. Well, you can laugh if you want. I aimed a little high. I was hoping we'd memorize Philippians. Not so much. But we've memorized the first chapter. (A little shaky in the second-to-last paragraph.) And now that we're studying astronomy I thought we'd finish off the year by memorizing Psalm 19. That's going a lot faster, probably due it being poetic. Around the house... I'm enjoying my new curtains. Still no pics - I'm waiting for the right light. Piles of laundry, and it's too wet to dry it outside. The deer ate every one of my tulips. And I need to balance my checkbook. A Few Plans For The Rest Of The Week: Wyatt's piano lesson, Tate's sign language class, Gunnar's AWANA Awards Ceremony, and ??? my children learn cleanliness, not godliness. my children become people-pleasers, not obedient children. We decided we'd better release the salamander, lacking confidence in our ability to forage for him. He has great color - really amazing. He has a sporty green streak down his back that is just the color of pond scum, and his skin is actually sparkly - looks like light reflecting off of very wet mud. Tate was holding him very carefully and gently, I have to say. He wanted to be sure to get a picture of the sparkles on his underside. Sometimes I get little ideas, but they're not worth a post of their own. So they sit on the back burner until I forget them. Off the tip of India, near the equator. Your google is as good as mine, so if you investigate, you'll see the sizzle may be better than the steak, (like a Muslim government and an average elevation of about 3 feet above sea level), but seriously, does that picture not make you think, "Is this what heaven is like?" Or, "That water is so blue, if I swim in it will it stain my skin?" Or, "Would I care if it did?!" We were weeding the flower beds. I have to give the boys credit, they wanted to help. Of course, their enthusiasm often overrides their good sense, like when they continued to pull "weeds" and fling them right over my head into the wheel-barrow, without first shaking the dirt off the roots. Thank you. I really needed a dirt bath. Then, of course, there's the whole problem with plant identification. They were amazed to discover that a "weed" is not one specific plant, like a poppy or a clematis, but there are, indeed, a variety of weeds. Because it's so warm here today (you know, maybe 60F) the boys felt the need to have a squirt gun fight. Nobody came to me crying or bleeding, so we'll assume it went well. After an hour or more of playing with the lizards again, the boys have informed me that it was Joe, and not Quartz, who lost his tail. I knew you'd need this information. Why, oh why, do the manufacturers of kids' toys include an incessant stream of sound effects? When the boys were smaller we got a couple of Leap Pads, and even now we could use them for educational purposes. Except for Tate. It's hard enough for him to decode what a recorded voice is saying with no visual cues, but then throw in a layer of loud, useless, bee-boppy sound effects and it becomes an exercise in frustration. Wouldn't it be nice if they made separate volume controls for the sound effects? Or you could turn them off? Like a sing-a-long CD with a separate track for the vocals and the accompaniment. I keep changing the look of the blog. I move the furniture too. But here's the deal. I like having a wider space for the pictures and posts, but all the cool free blog backgrounds are for Minima! All you clever designers at The Cutest Blog on the Block, or Aqua Poppy, or The Blog Fairy... have mercy and whip up a bunch of Stretch Minima backgrounds. I know, I know, we're obsessed, lately. Mom, you'll want to look away. So, the boys were playing with the lizards today. They've named them and claim to be able to tell them apart. They're probably right. "Quartz" is the lizard we caught earlier this week. He lives in the aquarium. "Bob", one of yesterday's catches, lives with him. We found them all snuggled together this morning keeping warm. Have I mentioned it's still pretty chilly here? "Joe" will fight, so he has to be separated and lives in a five gallon bucket. Anyway, they had the lizards out and were playing with them when I heard a commotion. Some day I'm going to do a study. I'm going to count how many sentences in one day start with, "Mom!" "Mom! Ya gotta get down here and see this! Quartz' tail fell off and it's twitchin'!" So, one by one, they appeared in my office with the delightful story. And pictures. I apologize for the blurry photo - they were excited. Notice that Quartz is indeed sporting a rather stumpy tail. I made this pic smaller, but you can click to enlarge. It really is interesting if you're not the squeamish type. About the boys - really, they're not cruel. They weren't torturing the reptiles. They had them out to hold, and all the lizards decided to make a break for it at the same time. There was a frenzy of grabbing for them, and ta daaaa. Besides, it was the perfect opportunity for discussion, when Gunnar (looking out the window) asked, "Mom?! Why is his tail still twitchin'?" Because God made it that way. If a hungry predator made a grab at the lizard, he might pull the lizard's tail off. If the tail just lays there (lies there?) the predator will be more likely to notice the lizard skittering off as fast as he can. But if the tail twitches around for awhile, the predator might be distracted by that, allowing the lizard time to escape. It's really his only defense. He can bite, but he's got no teeth that we can see, and he's not venomous. Okay, well, he has one other defense. He'll try to poop on you. Yuck, but not scary. Gunnar, feeling sorry for Quartz, made a closer inspection and reported that his stump wasn't bleeding - there were just a few drops of blood that were already drying. Oh, I'm a lucky mom. The boys came home from Grandpa and Grandma's with more lizards. Now they each have their own. That is, if they'll coexist in the aquarium. You can see two in this photo. Although one is in motion and blurry, you can see the color variation. Then, while they were turning over the pavers to look for food for the lizards (bugs, centipedes, snails), they found an as-yet-un-photographed salamander. 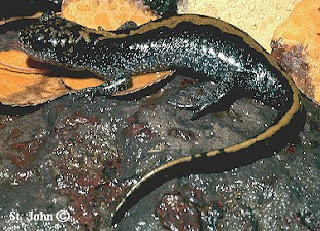 He looks a bit like this, and is probably an Ambystoma macrodactylum - a long-toed western salamander. Long term, team players needed, for challenging permanent work in an often chaotic environment. Candidates must possess excellent communication and organizational skills and be willing to work variable hours, which will include evenings and weekends and frequent 24 hour shifts on-call. Some overnight travel required, including trips to primitive camping sites on rainy weekends and endless sports tournaments in far away cities. Travel expenses not reimbursed. Extensive courier duties also required. Virtually none. Your job is to remain in the same position for years, without complaining, while constantly retraining and updating your skills, so that those in your charge can ultimately surpass you. Get this! You pay them! Offering frequent raises and bonuses. A balloon payment is due when they turn 18 due to the assumption that college will help them become financially independent. When you die, you give them whatever is left. The oddest thing about this reverse-salary scheme is that you actually enjoy it and wish you could only do more. While no health or dental insurance, no pension, no tuition reimbursement, no paid holidays and no stock options are offered, this job supplies limitless opportunities for personal growth and free hugs for life if you play your cards right. As if life were ever normal around here. At any rate, this is what we're doing today. Kerry is out at the church. They've been waiting for a break in the weather to tear off part of the roof on what my boys fondly call the cookie room, (probably better known as the fellowship hall), and re-roof it - connecting it to the new addition. In our part of the world getting two consecutive rainless days in the spring is somewhat iffy, so they're going to "make hay" as fast as they can. Dad is doing fine. Hallelujah again! I had discussed with the boys his need to take it easy for a few days, and the probable difficulty (frustration) he'll have with this. They arrived and Tate promptly announced, "Grandpa, you're under house arrest!" And then they went downstairs and filled the wood-box. True to form, Dad sent an email around to his friends, adding a post-script which said something like, "I'm not to lift anything heavier than 10 pounds, to avoid opening the incision in my femoral artery. My nightly bowl of ice cream is now off limits." And I am sitting home, in an uncharacteristically quiet house, trying to drag my eyes away from the sunshine outside and get my bills paid. He'll still have some major life adjustments to make, but the "threat level" just dropped a few notches. Before they would release my dad, this morning, they decided to do an echo cardiogram, and - whoops - noticed that he has an aneurysm in his aorta. So now they've got him queued up for a CT scan to get a better look inside. Best case scenario? It's not what they think - not a big deal, and he comes home later today. Worst case scenario? Open-heart surgery. I'll update later today, after Mom gets into the hospital and she and Dad see the Cardiologist. I'm married to Kerry and my dad's name is Kim, (and you can probably tell by the occasional photos, we're not Asian.) This has led to occasional confusion. Like last night, when my sister dropped by the hospital on her way home. She stopped at the reception desk and asked where she could find "Kim _______", and was told, "Oh! She's in the Childbirth Center!" Ummm.... really, no... I don't think so. I thought today was going to be an ordinary day. My dad called around lunch time (because he couldn't get through to my mom) to tell me that he'd stopped in at the doctor's office and they wanted him to go over to the hospital for some tests. Okay, right there I was alarmed. Because my dad rarely goes to the doctor. As in, almost never. Whatever is bothering him, he'd rather tough it out. But apparently he's been having some "symptoms" for about four weeks. When he exercises hard he gets short of breath, and feels like he has heartburn, or needs to burp. But that's no reason to go to the doctor. Right? So, since he happened to be in town today (and mom had been encouraging him to talk with the doc), he decided to drive on over to the doctor's office and make an appointment in person. Okay, in case you missed it, that was the hand of God, people. He drove himself to the doctor without the impetus of something extreme (like 2nd or 3rd degree burns, or dangling digits). So, if you don't know my dad... when he gets nervous he talks. While they were hooking up IV's and sticking monitors all over his chest, and getting all his vitals he kept up a running commentary with the nurse... cracking jokes, accusing her of sadistic behavior (related to his hairy chest and all the sticky electrodes and tape), asking if she was going to shave a happy face onto his chest by the time she was done, joking with other patients about the different styles of hospital gowns, and so on. He'd met his match in the nurse, though. A mom of three boys herself, she took him in stride. As they were wheeling him down to the Cardiac Unit he said, "I'd offer to walk if it weren't for this gown." She shot back, "Then you'd be an ICU." But to make a long story longer, they did a Cardiac Catheterization (sent a catheter up an artery from his groin into his heart), and this is the upshot: Of the three arteries in the heart, two had some blockage, and the third was 95% blocked. He has apparently had a minor heart attack, probably sometime in the last three days, and he didn't even know it. His heart function looks good, (it's squeezing like it's supposed to), so it doesn't look like there was any permanent damage. They were able to open up the artery and put in a stent. He's spending the night in the hospital and they expect to release him tomorrow morning. On the one hand, we are praising God for all the circumstances that got Dad to the hospital today. Honestly, I can't imagine my dad thinking it would be easier or more convenient to drive to the doc's office to make an appointment rather than calling from home. And, though this may sound silly, the rainy weather probably contributed to that. If the weather had been better he would probably have gone right home and been working on a project, or cutting down trees or something. Okay, maybe I'm reaching, on the weather-factor, but we are really, really thankful that Dad got to a doctor when he did, before things got worse. On the other hand, this is A Big Deal. He has Coronary Artery Disease. He'll be on meds for the rest of his life, and he'll hate that. But, possibly even more difficult and annoying, he is not to do any work or lift anything heavier than a gallon of milk for the next 7 to 10 days. And that is going to drive him absolutely nuts. So, if you think of him, pray for him. And - especially for the next week - pray for my mom! It's going to be a full-time job for her, trying to keep him from exerting too much, too soon. We'll be praying - a lot - because we really want him around for a lot longer. That's my story. Thanks for listening. And here is my little corner of it. And I have this tension: I don't want to pour out such ridiculously mundane trivia of our lives that nobody in their right mind wants to read. But on the other hand, too impersonal = boring. So, I give you this Tuesday evening offering of randomness, from out house to yours. 1. The Bible reading is going great. I'm kind of in quiet awe. I don't want the boys to think that I had low expectations, but frankly, I'm a bit surprised we've made it this far. If you're new here, we're trying to read through the whole Bible, aloud, in a year. We're using The Daily Bible, so we read an OT passage every morning at breakfast, a NT passage at lunch, and a Psalm and a couple of verses from Proverbs every evening with dinner. Yes, we've occasionally gotten behind, like last weekend when Kerry and I went to the homeschool conference. But not so far behind that it seemed like a huge amount of effort to get caught up. And I think the boys are kind of proud of themselves :0) They often volunteer to read aloud. 2. The boys got their "Summer Buzz-Off" haircuts early this year. I didn't get photos... I was a bit distracted. I usually wait for warmer weather, but Gunnar went happily off to AWANA and the next morning we were told that there was someone there with lice. 3. I like to think that we live in a nice neighborhood. Maybe I'm delusional. My first clue was the big drug bust, a year and a half ago, just around the corner. It was a big deal. Swat team, dogs, concussion grenades, etc. The house was seized and resold. Then - unrelated - in the last two weeks the police have reopened a 19 year old "missing person" case, most likely a murder. They've been digging up the yard and basement of a house a couple blocks away. 4. On the way home from our sign language class we saw two more Northern Alligator Lizards. They were too fast for me, but Tate (or course!) caught one of them. 5. As we finished dinner Kerry commented on a goody bag Gunnar brought home last weekend. Gunnar recounted for us the wonderful awesomeness that was Juliann's party, culminating with an obstacle course involving ladders, tunnels, balancing, and "throwin' sponges at headless Barbies!" Outside My Window... Our two dogwood trees - one pink and one white - are just about ready to pop. In the front of the yard we have a beautiful tree... but I'm not sure what it is. Must be some sort of ornamental, as it doesn't get any noticeable fruit. Maybe an ornamental plum? It blooms at the same time as the cherries and apples, but is a much deeper pink. The boys are funny. They know I'm not a pink person, but we all agree that pink is pretty in nature, where God put it! It's as if they have to remind me (or themselves?) that it's okay to like our pink tree. I am thinking... that I don't want to be obsessed about it, but I'm am intrigued by the locations that pop up in my "Feedjit" box. People I don't actually know read this blog, and that amazes me. People from the USA, people from Canada. Okay, some of those people I know :0) But someone from India reads. And someone from the Netherlands. And the U.K. And Slovenia. And Turkey. I am thankful for... the praying moms in 'my' MITI group, boys who make their own fun, Wyatt practicing the piano without too much coaxing, Tate's delight in tree frogs, Gunnar's compassionate heart, a little bit of work that came in for Kerry, and church friends who invite us over for lunch and expect us to stay all afternoon until evening church. From the learning rooms... light at the end of the tunnel. No, I don't quite like the way that sounds - as if we've just been enduring until the end of the school year. Not so :0) But we're still looking forward to shifting gears for summer! From the kitchen... nothing. We had an early Cinco de Mayo party with our MITI group this afternoon with a big Mexican lunch so I'm just making soup and sandwiches for dinner. I am wearing... jeans, t-shirt, sweater. It may be spring, but it's not very warm today. I am creating... don't ask. I feel guilty. I am going... to get my office under control. Really. This week. I'm either going to start the quilt I've been sketching, or clean up all the material and sewing stuff and put it completely away. I've had the ironing board next to my computer since before Christmas. Ugh. I am reading... What He Must Be, by Voddie Baucham. I am hoping... Really, really, really hoping Kerry gets some more work. I am hearing... Wyatt plinking away, Kerry showering, and birds chirping. Around the house... the boys and I cleaned their bedroom over the weekend and I got out the spring sheets :0) It's been such a cold spring that here it is, May already, and I still had our big down comforter on the bed! One of my favorite things... the sight of Gunnar, flopped down on his stomach in the grass on a sunny day, happily trying to knock over little plastic soldiers with his squirt gun. A Few Plans For The Rest Of The Week: thankfully, not many. The kids finished their swim lessons, Gunnar has just one more AWANA, and I'm happy to be home more this week. The Tree. It's actually deeper pink, but you get the idea. * Wail and shriek and scream bloody murder while I remove the sliver (about which he's in a panic) until my last nerve is about to snap. Then, as I finally, gently slide the sliver out, snap back to normal and say, in a perfectly calm and reasonable voice, "Oh - did you get it out?" * Wait to decide he needs to poo until the moment we're walking out the door? Sunday Morning Testosterzone - P.S. At least - and, truly, I'm thankful - they behaved themselves in church. I've mentioned before that all the kids at church are encouraged to take notes. (And the pastor facilitates thise by preaching from an organized outline and emphasizing and repeating his main points.) The kids write their notes on 5x7 cards and leave them, stuck to the fridge in the kitchen, for the pastor. Then, next Sunday, he acknowledges those kids by name from the pulpit. The littlest kids draw pictures, some kids obviously get help from mom or dad, and even the older "kids" - like high school and college age - will sometimes leave their notes on the fridge. Okay, honestly, I'm probably missing some of the richness in the sermons myself because I'm repeating things for Tate (who can't hear a lot of what is said), but it's so, so very worth it to have the kids engaged in the message. This is how it plays out for us. Wyatt, at 12, doesn't need any help to get the text and the main points, though we're working on getting him to listen and write down sub-points, or supporting details and references. Tate, at 10 (and with his hearing impairment), is expected to get the text and main points with my help. He often likes to draw a picture on the back of his notes of something from the text that came up in the sermon. Oh my, I have totally neglected these, so I'm going to toss out the last three together. Guiltar: A musical instrument whose strings are pulled by your mother.